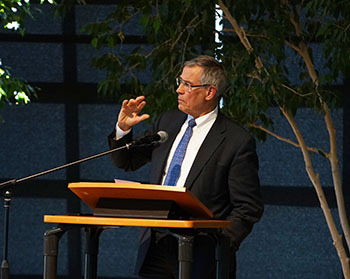 Rush Holt called science "the greatest invention of the last half milennium'' during the Osterbrock lecture on campus. Photo by Yin Wu. In the current “post-truth” era, scientists face an erosion of public trust, even as they make major advances and discoveries. In light of this distressing situation, distinguished scientist and former congressman Rush Holt urged scientists to “stop complaining about public misunderstandings and decrying public attitudes toward science” and do something about it during a rousing speech at UC Santa Cruz last week. Holt was on hand to deliver this year’s Osterbrock Distinguished Leadership Lecture, sponsored by the Osterbrock Leadership Program, which provides thoughtful and informed leadership training for UC Santa Cruz graduate students. Holt addressed a rapt audience of 115 people, which was like a “who’s who” listing of distinguished science professors at UC Santa Cruz. No less than Sandra Faber, professor emerita of astronomy and astrophysics and a recipient of the National Medal of Science, introduced him to the crowd. “Rush Holt is better qualified than almost anyone to talk about the role of the Ph.D. scientist in shaping science policy,” she said. Holt urged scientists to empower and not talk down to the public, while encouraging non-scientists to value hard evidence rather than empty rhetoric. During his remarks, he spoke with urgency. Holt, a teacher, scientist, administrator, and policymaker, asked scientists to reconsider their approach to getting the word out about their research. “The most important challenge is how to build a broad and deep understanding of how science works, convincing readers, and the public, that the most important benefit of science to society is science itself,” he said. Holt is in a strong position to address such pressing issues. As CEO of the American Association for the Advancement of Science (AAAS), he leads the world's largest multidisciplinary scientific and engineering membership organization. Prior to joining AAAS in 2015, Holt served as the U.S. Representative for New Jersey's 12th Congressional District, directed the Princeton Plasma Physics Laboratory, and taught physics at Swarthmore College. He holds M.S. and Ph.D. degrees in physics from New York University. In the process, he said, scientists need to work harder to fight the notion that science is something esoteric and inaccessible, locked in a secret vault that is accessible only to trained scientists. If evidence itself becomes the primary talking point, this shift in focus could change the public discourse around science, while diminishing the hostility that scientists face, Holt said. At the same time, this emphasis on evidence could change public scientific discussions and lead to the reframing of crucial questions.